A new Bord Bia study has revealed that almost 9 in 10 (87%) Irish people have breakfast every day, with this rising slightly (to 89%) at the weekends. While this large number is positive, it seems Irish people cannot switch off at meal times – 2 in 5 Irish adults (41%) check emails and social media while eating breakfast. Over 20% of people use the time to also take daily vitamins, while watching TV, finishing household chores and getting the kids ready also featuring highly. “The Breakfast Club” research by Bord Bia analysed consumer attitudes towards breakfast and will assist in providing direction to the Irish food and drink industry on breakfast innovation, branding and marketing opportunities in the future. Bord Bia launched the report this morning with a presentation to over 50 Irish food and drink producers servicing the category including Flahavans, O’Brien Fine Foods and O’Egg. – Bread and toast tops the survey as Ireland’s favourite midweek breakfast for one third (33%) of people. This is followed by porridge (25%), cereals (19%), eggs (18%) and fruit (17%) respectively. Tea is the preferred drink at home with nearly half (44%) of people drinking it during the week, while another 28% drink coffee. Water and fruit juice follow behind at 12% and 9% respectively while only 4% of people drink a fruit smoothie they have made themselves. – Half of all breakfasts in Ireland are eaten between 8am and 10am. On average, we spend 13.6 minutes on our breakfast during the week and 16.3 minutes at the weekend. – Half of us will never miss breakfast while those that that never or rarely eat breakfast are likely to be single and young settlers (aged 21 to 29). – Half of Irish people are eating breakfast alone while 1 in 6 Irish people are under time pressure and stress while having breakfast. – To some extent, it is a predictable eating occasion, as 3 in 4 (74%) are certain or pretty sure what we will eat tomorrow. 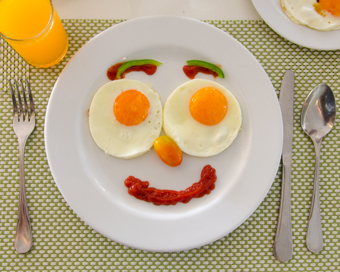 Only 7% of Irish adults vary their breakfast during the week however this jumps to 18% at the weekend. – In line with Irish adults, 85% of Irish kids also eat breakfast at home. Cereal was found to be the number one choice for kids followed by toast or bagels and porridge. Parent’s choose their kids’ breakfast items as “they know the children will eat it” and “to get something into them”. Read the report in full here (pdf).